Mainly, Vanier argues that Western society often perpetuates the myth that individuals are solely responsible for their own self-determination. In other words, according to this myth, a responsible individual is ideally one whose actions are strictly a result of his or her own deliberation, actions that do not owe a thing to any other person. This myth is encouraged by overemphasizing individual rights. We value, rightly so, the freedom to make economic, social, and political choices. For example, we often get upset when someone tries to tell us what we can and can’t do with our money, such as the state telling us we have to pay taxes. Overemphasizing the importance of independence can, in Vanier’s words, “diminish the love we can share and the vulnerability we can show to one another”. Life is not simply about independence, it is also fundamentally about belonging to each other. Although correct in its ability to value independence, rights-based language has little appreciation for the ways we belong to one another: how we depend on others and how others depend on us. * Nowhere, I believe, is this character of life more evident than in the experience of birth and death. Having recently experienced birth and death in my own family, I can tell you that children as well as those who are near to death are huge “burdens”; they require a ton of help and attention. Two examples that immediately come to mind are the way my aunt courageously cared for my Grandmother as she slowly succumbed to dementia and the way my wife tirelessly cared for our newborn sons in their infancy. In order for Grandma and my boys to have a meaningful life, my aunt and my wife had to provide countless hours of intense care, concerning themselves with the most basic needs of the vulnerable. We all depend on others to some degree. Vulnerable persons, such as the elderly and the young, especially remind us of this dependence. It would be a mistake, therefore, to understand these burdens as simply that—as burdens that need to be discarded. Overemphasizing the virtue of independence can diminish the perceived necessity of belonging, making our interdependence appear as something it's not—a burden. In such cases, the vulnerable can be lead to believe that their state of neediness is a shameful thing. An over emphasis on independence, Vanier argues, has disastrous consequences for humanity and it is a serious issue to be considered in discussions of assisted dying. Vulnerable persons should not be ashamed of needing help, they are not burdens to be discarded, but, rather, they form the foundation of our belonging to one another. This point is clearly displayed in the examples of my wife and my aunt: the most intense moments of vulnerability are occasions for heroic expressions of love. And, more generally, relationships are made meaningful because of the ways we depend on each other. We belong to each other because of our interdependence. The courageous women in our examples demonstrate the cost of love, or as is described in the Gospel of Luke, the cost of discipleship. We don’t have much of a choice about who we belong to and who belongs to us. This aspect of life—belonging—has a gift like character, we receive burdens just as we are burdens to others. 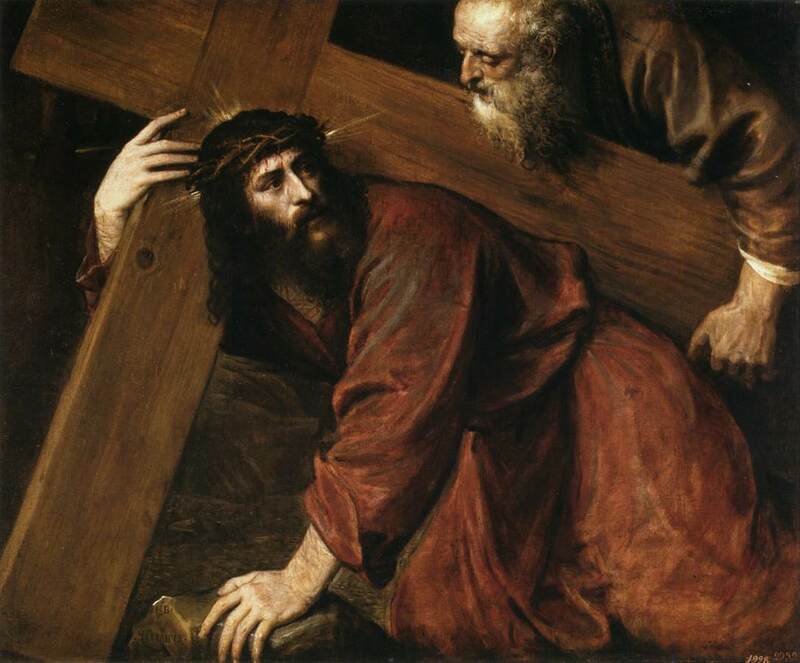 Like Simon of Cyrene, we have very little choice as to the nature of the cross we are called to bare. Dependency is vulnerability since we can’t control the actions of the others on whom we are dependent. Christ’s vulnerability is displayed through his reliance on Simon. Our dependence on others is risky because these others often fail in their commitments to us: parents fail their children just as children will fail their parents. Dependency is the foundation of independence. One is not free to exercise their rights if they do not belong. Christ is not free to do his work unless he has a family and group of disciples to which he belongs. 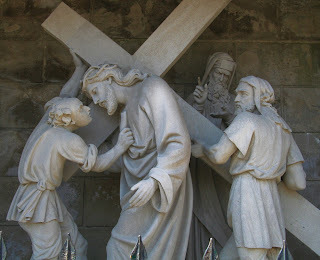 And, interestingly enough, in the case of Simon of Cyrene we observe how belonging extends beyond our inner circles. Belonging creates a kind of darkness or opacity. This is clearly evident in the most intense examples of dependency: birth and death. In these moments of life we have no control over our circumstances and, in this sense, we walk in complete darkness. The flashlight that guides us into this world and beyond it belongs to another and we have little access to it. Darkness, as defined here, is ambiguous; it’s neither good nor bad. Nonetheless, it seems to haunt the way we belong, extending into the womb and continuing beyond the grave. Thus, we must account for it. Here I think we finally arrive at some of the interesting lessons revealed by Simon of Cyrene’s brief appearance in the passion narrative. Although as far as we can tell there is no prior relationship between Simon and Christ, this unlikely pair belong to one another at Christ’s most vulnerable moment. Christ’s life is in Simon’s hands, and Simon, by the design of the soldiers, finds himself responsible for a man he barely knows. Similarly, our actions depend on others, whether these others be our parents who care for us in infancy or a stranger who recognizes us as legitimate subjects, for example. Others, beyond our immediate family, depend on us in our daily activities, such as when we respect one’s right to private property or one’s right to enter an intersection when the traffic light turns green. Without such recognition agency would be severely hampered. Christ’s dependency on Simon and Simon’s responsibility to Christ highlights some of the ways we belong to others, such relationships may not be of our own choosing, but we would be lost without them. *A precise and persuasive argument for this point as it relates to the political realm can be found in Shannon Hoff's article, “Rights and Worlds: On the Political Significance of Belonging”, The Philosophical Forum, Inc. 45, No 4 (2014): 355-373. First image used is in the Public Domain, hosted at Wikipedia; Second image used is from Sharon Mollerus, hosted at flickr, used under the Creative Commons 2.0 license.. I liked this post, you've touched on something I've been thinking a lot about lately. Our society seems to value individuals almost in spite of the community. We have rights but few responsibilities or obligations. Historically it seems like many societies slanted the other way (correct me if I'm wrong). A person is, after all, produced by society and the family and cannot begin to make significant contributions for some time. I think Christian poses, not a middle way, but perhaps the best of both? On the one hand, each person is created in the image of God, and meant to be His Sons and Daughters. Nobody can therefore be looked over or done away with. On the other hand, that involves a calling to be totally dedicated to each other (like one body). Also, I think you really hit it on the head when you talked about the danger of the old or infirm feeling guilt about needing help. None of us would be here because we've all been infants and needed constant care (and probably not only then). It’s good to hear from you Stefan, thanks for the comment. The part about feeling ashamed of our neediness was an aspect of Vanier’s article that really hit home for me as well. Shame was mentioned in the context of those suffering from depression and vulnerable to thoughts of suicide. Although I relate our inter-dependency to birth and death, you’re right, it’s really something that seems to permeate each moment of our lives, something I tried to bring out in my last paragraph. Yes, I liked this a lot!